This story uses panels from Barks' "The Money Well" (W US 21) (see Fort Duckburg's page), "The Big Bin on Killmotor Hill" (WDC 135), and "Tralla La" (W US 6). A panel from "The Guardians of the Lost Library" is used in "The Lost Charts of Columbus" (D 94144). 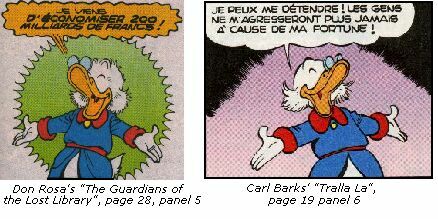 Panels from "Tralla La" are used in "Last Sled to Dawson" (AR 113),"Return to Xanadu" (D 90314) and Lo$ 12 : "The Richest Duck in the World" (D 93488), panels from "The Big Bin on Killmotor Hill" are used in "Cash Flow" (AR 106), and "His Majesty, McDuck" (AR 145), and panels from "The Money Well" are used in "His Majesty, McDuck" (AR 145), "The Invader of Fort Duckburg" (D 93227) (Fort Duckburg),"The Richest Duck in the World" (D 93488), and "W.H.A.D.A.L.O.T.T.A.J.A.R.G.O.N." (D 97052) (Fort Duckburg).